The level of risk tolerance is displayed using color-coding (for threats: green: low risk, yellow: medium risk, red: high risk). A high number of green cells on the chart indicates a high risk tolerance. A high number of red cells on the chart indicates a low risk tolerance. Color-coding for opportunities is the opposite. 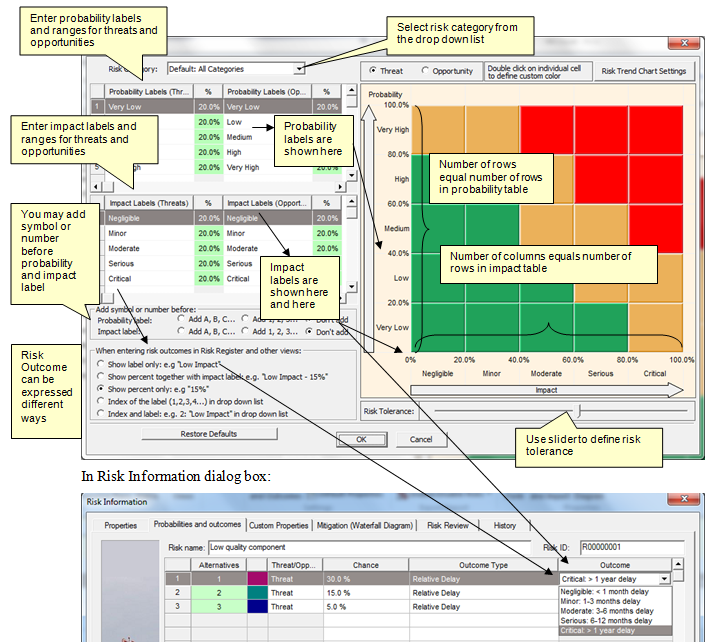 In the Format Risk Matrix dialog box, the number of rows in the Probability table corresponds with number of rows of the risk matrix, and the number of rows in the Impact table corresponds with the number of columns in the risk matrix. Therefore, to add or remove a row or column in the risk matrix, simply add or remove the label in the probability or impact table. For example, if in the Duration category, the impact label for "Threats" is "Low: 1 month delay", the impact label for the opportunity in the same category is "Low: 1 month acceleration". If you do not define labels for a risk category, the default set of labels will be used. You may modify the default set of labels by selecting "Default" from the dropdown list and then editing as required. Probability labels are used only in the Risk Matrix; impact labels used appear in the Risk Matrix as well as to define outcomes of each risk in the Probabilities and outcomes tab of the Risk Information dialog box. For example, an impact label "Low: 1 month delay" will be shown on the horizontal axis of the Risk Matrix. In addition, when you define the impact of a risk, which has an outcome type "Relative delay", you will be able to select the outcome "Low: 1 month delay". Select a risk category from dropdown list. "Default" category is used if you did not explicitly define labels for specific risk category. Modify the Intervals for Impact and Probability for the selected risk category. Modify the Impact and Probability labels as required for the selected risk category. Add symbol or number before probability or impact label. For example, instead of �Very Low� label you may use 'A: Very Low'. Advanced Settings allows you define different risk matrixes for individual projects or users (RiskyProject Enterprise only) as well as algorithm for impact calculation. You may change color of each cell by double-clicking on the cell. You may also define a name of each range, and order how different ranges are shown in the Risk Trend Chart, as well as the periodicity of the risk trend chart. Your settings will be saved to the system registry for all new projects on your computer. These new defaults will not affect any previous projects. You can also restore the pre-defined set of categories and outcome types by clicking on the Restore Defaults button.